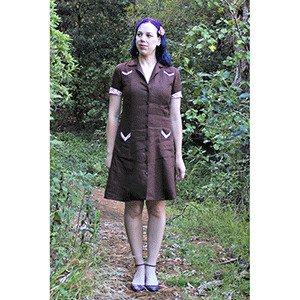 Melissa is a wonderfully versatile pattern - make it as a dress, as a blouse, or as a skirt! The Melissa dress is a sleek shirt dress, ending just above the knee. The blouse ends just above the hip. The skirt sits at the natural waist. Double princess seams at front and back, originating at the shoulder and extending to the hem, bring a touch of 1940’s elegance. V-shaped pocket openings on the bodice and skirt, a V-shaped inset between the shoulder blades, and short sleeves with cuffs that rise into a gentle point all add to the subtle 1940’s influence. 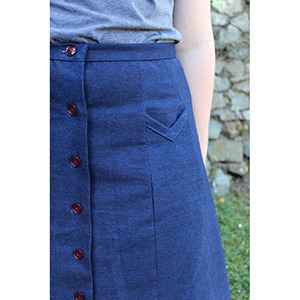 Slim pockets on the skirt are the right depth for a mobile phone or pens. Melissa has bodice pieces for both B-cup and D-cup bust sizes. 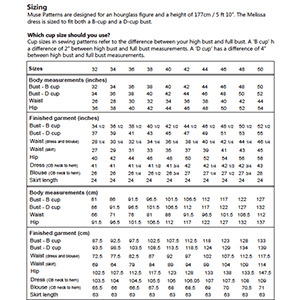 Along with the double princess seams, this helps make it easy to adjust the fit and get it just right for you. Make Melissa all in one fabric, or play with contrasts on the pocket edgings, cuffs, and back inset. This pattern is available in bust sizes 32-50. Suggested fabrics are rayon challis, crepe de chine, and other specialty wovens, flannel and lightweight wool. Lighter weight fabric such as voile, lawn, quilting cotton, poplin and seersucker are also good for the blouse.